Justin Hatch proudly displays his certificate of recognition for being named a commended student with the National Merit Scholarship Corporation. He is flanked by high school principal Donna Parkhurst and guidance counselor Matt Goodnough. 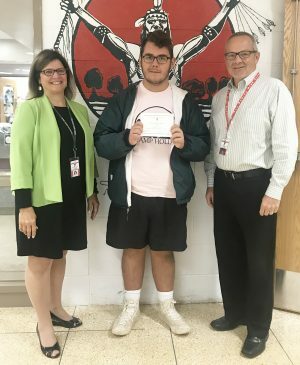 FULTON – G. Ray Bodley High School senior Justin Hatch has been recognized as a commended student, based on his score from last year’s PSAT. GRB Principal Donna Parkhurst said Hatch is only the second high school student within the Fulton City School District to receive such an honor from the National Merit Scholarship Corporation since she has been a leader at GRB. As a commended student in the 2019 National Merit Scholarship Program, Hatch is one of 34,000 students recognized throughout the country. He, along with fellow commended students of the program, placed among the top 50,000 scorers of more than 1.6 million students who entered the 2019 competition by taking the 2017 Preliminary SAT/National Merit Scholarship Qualifying Test, according to the NMSC.